To make the euro sustainable, the European financial elites want the Italians to reduce their spending and turn a budget deficit into a budget surplus. However, due to the country’s shrinking population the Italian budget deficit — as we have argued many times – can only increase. The European commission rejects the Italian budget because Rome wants to increase its debt far beyond the limit allowed by the ECB. “This is the first Italian budget that the EU doesn’t like,” wrote Deputy Prime Minister Luigi Di Maio on Facebook. “This (the rejection of the Italian budget plan by the EU) doesn’t change anything.”. The country has entered a demographic winter and sustainable economic growth is simply impossible, at least for the foreseeable future. As is the case with the whole of Europe, the continent needs a plan to support an ageing and declining population. As if not aware of it, the Brussels-Frankfurt establishment only wants Italy to stick to their austerity program, i.e. decrease public spending and do away with the current Italian administration, which refuses to comply. To force Prime Minister Luigi Di Maio and Matteo Salvini out of office, the European Union will go to any lengths to destroy the Italian banking sector the way they did it in Greece and Cyprus. In 2015 Greece shut down its banks, ordering them to stay closed for six days, and its central bank imposed restrictions to prevent money from fleeing out of the country. Jeroen Dijsselbloem, former head of the euro group, suggests that the financial markets should try to lower the value of the Italian bonds. A lower bond value will erode the capital of the Italian banks and make them insolvent. Mario Draghi, head of the ECB, warned last week that a recent sell-off of Italian government bonds was set to dent the capital of Italy’s banks which own about 375 billion euros ($426.30 billion) worth of that paper. The remarks of the Central European Bank’s chairman were carefully prepared as another deliberate attack on the Italian financial system. It is highly unusual for central bankers to warn the bank under their supervision against insolvency, at the same time trying to provoke a preemptive bank run. The Italian rulers know that they are under assault and are contemplating how to shield the banks from the European banking authorities. Rome has to come up with a national strategy to preserve its banking system even if this is against the European rules. Matteo Salvini, leader of the Northern League, met with his counterpart from the Five Star Movement, Luigi Di Maio, to discuss the condition of the Italian economy, budget and banks, a spokesman for Salvini said. “No banks will be in difficulty,” Salvini said. The two parties, which are running the country in a coalition government, are working in sync, he said. Premier Giuseppe Conte asked government agencies to prepare options to help the lenders if the decline in the value of their holdings of government debt requires them to recapitalize the banks, Corriere della Sera reported. The leadership in Rome will not leave it to Brussels or Frankfurt bureaucrats to decide whether Italian banks are insolvent or not. In theory, every sovereign government can declare a bank solvent by the stroke of a pen. The Italian authorities can refuse to close their banks and force them to stay in business. Unlike Greece, Italy has a trade balance surplus and the country does not depend on a foreign supply of money to pay for its imports. Keeping insolvent banks open will further undermine the reliability of the euro as a common currency. To put even more pressure on the Italian government, Karsten Wendorff, Member of the Advisory Board of the German federal banks, suggested confiscating private Italian properties to make good for the Italian public debt obligations. “Instead of a European fund that buys Italian government bonds and that is ultimately backed by European taxpayers, a national fund should be created,” Wendorff wrote in the Frankfurter Allgemeine Zeitung Saturday. The general public is unaware of the seriousness of the situation. 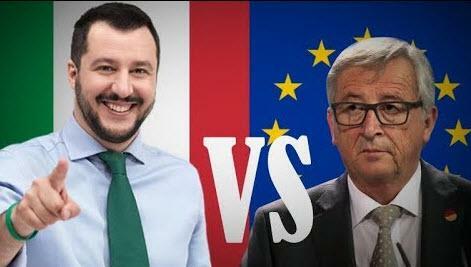 Both Salvini and Matteo – as well as the Italian people – should realize that they are at war with the European establishment which ultimately intends to remove them from power. To win this battle they need unconditional support from the state security apparatus and the Italian people. The confrontation between Rome on the other hand and Brussels and Frankfurt on the other, however, will not break out before the European Parliament elections.